On Thursday March 31, Sophia Mundi Celebrated the annual Harvest Festival. There is an unusual importance to the nature of this festival which we celebrate at Sophia Mundi in the first term of our school year. What you should know, is that we are celebrating not one but two festivals at the same time! This is a strange event, but it happens for us because we live in the southern hemisphere and our seasons are the opposite of the seasons as they fall in the North. Actually, in all part of the world, at this time of year, we celebrate Easter. But in the North, Easter is a Spring festival, whereas in the southern hemisphere, we experience Easter, not at springtime but in Autumn. At Easter we celebrate Christ rising from the dead and the victory of the human spirit over matter, and this affects all people no matter where they live or what season they are in. But this is only one side of the story and ‘Harvest’ isn’t the name of the second festival! The second festival we celebrate at this time of year is a seasonal festival. It is called Michaelmas, or the festival of St Michael. We are not so familiar with this festival because it occurs in the Northern countries when we have Springtime – it is their Autumn Festival. Because we have Easter in Autumn we often overlook the festival of St Michael. We would like to celebrate both. In the season of Autumn we recognise the inner strength it takes to live as humans in harmony with nature. During Summer we feel all the powers of nature active in our lives. This wonderful energy is so strong it would devour us if we did not stop it. It would draw us back into nature to live wild and free like the animals and birds. This is our Dragon. Instead, in Autumn we must use our inner strength to fight this force of nature, and restore our dignity as human beings. This is the festival of St Michael. With his sword of flaming iron, St Michael beats down the Dragon and defends our right to be human. So, we call our celebration of these two events the Harvest Festival. At harvest time we reap the fruits of summer and prepare them for winter. It is a time to give thanks to Nature, for all she provides, and to remember that as human beings we have to keep finding the inner strength to care not just for each other, but for everything in our world. This is what makes our Harvest Festival. 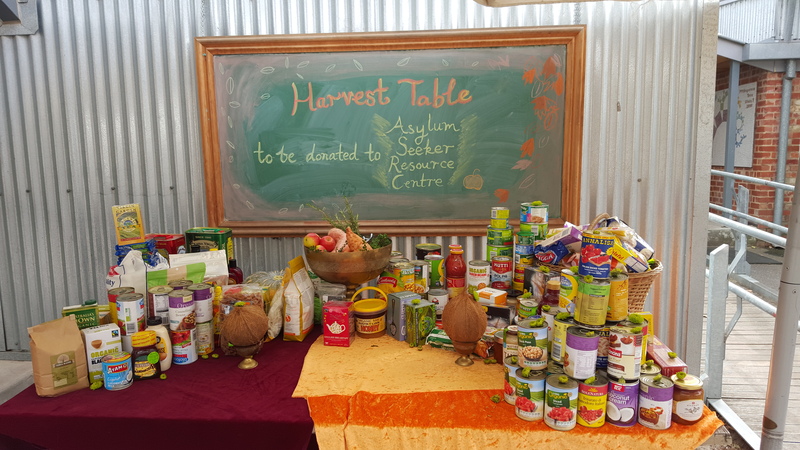 As a gesture of our gratitude to Nature and the seasonal harvest; and our goodwill for our fellow people, we have collected donations of food to give to people who have little or none.